The concept of Easter eggs is something that has been around for centuries. When you prepare these eggs for the holiday, you are doing more than just creating some vibrant-looking eggs. You are also participating in an interesting tradition that is a major part of the Christian faith and has been for centuries. The egg is believed to be symbolic of an empty tomb. This is because the creature inside the egg can hatch from it. 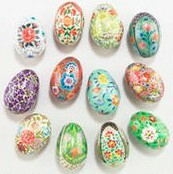 The eggs are also painted primarily as a means of showing interesting faith. In fact, the early Christians often used red paints on their eggs in order to symbolize the blood of Jesus and blue to symbolize his tears. There is also the symbolic belief that the creation of life from an egg is believed to be a reminder of the resurrection of Jesus. The symbolism is something that has been used for centuries and continues to be followed to this day. It truly adds to the fascination that comes with the holiday. It is a big part of what happens here that deserves to be thought about as you prepare your eggs. Another tradition that you might be interested in seeing relates to Lent. While you might know about the meat and dairy restrictions that come with a Lenten fast, it used to be that eggs were prohibited during this period. This rule is no longer enforced in the Western world though. This old rule that was used for centuries is reflected in the tradition of Easter eggs. People would consume these eggs on Easter Sunday as a means of celebrating the breaking of the fast. Of course, it is a tradition on its own for you to eat the eggs as they are finished. One of the most interesting parts of Easter eggs that you might not think about is that they are made as symbols of fertility and the ways how it is run. This is often used as a symbol of rebirth. The fact is that Easter eggs are often made as eggs that symbolize the growth of a new season with new possibilities. The world is coming out of its slumber from the winter and into a bright new time. This is an interesting part of the traditional because it relates so well to the need for people to get ahead of themselves and to focus on a new time of interest. It is a particularly fascinating way how people can see the holiday for what it is. The tradition that comes with Easter eggs is a fascinating thing to see. You might be amazed at how historic the concept of these eggs has been and how they relate so heavily to this important holiday.